Simulations by researchers at Tokyo Institute of Technology and Tsinghua University indicate that Earth-like planets are more likely to be found orbiting Sun-like stars in terms of water content of planets rather than lower-mass stars that are currently targeted in the search for habitable planets. The findings are reported in Nature Geoscience, published online 7 February 2015. For planets to be habitable, they must orbit stars within the ‘habitable zone’ where it is not too hot or too cold. In addition, recent studies on habitability of planets suggest that the water-land ratio must be similar to the Earth. That is, the water mass fraction should not be far from that of the Earth’s (~0.01wt%): planets with too much water (> 1 wt%)—“ocean planets”—lead to an unstable climate and lack of nutrient supply; and water-poor, Venus-like “dune planets”—become too arid for habitation. Whereas G dwarfs – stars with the mass of our Sun – keep almost constant luminosity during the ‘pre-main sequence’ of their evolution, where the luminosity of M dwarfs decreases by more than an order of magnitude during this stage. This means that planets with the right amount of water at the right distance from M stars may become too arid from over-exposure during the higher-luminosity, early pre-main sequence period, while ocean planets retain a large amount of water. Planets are understood to form alongside stars. As matter condenses under gravity to form a star, the surrounding circulating matter begins to flatten into a protoplanetary disk, a little like a spun clump of dough flattening to form a pizza base. Matter in this disk coalesces to form planets. Models incorporating various factors have been developed, tested against observations and augmented, making it possible to simulate the planetary bodies likely to form and their characteristics. However until this study nobody had modelled how the change in luminosity of M stars might affect the surface water content of planets in the habitable zone. 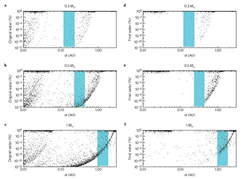 The simulations by Ida and Tian indicated that for 1000 stars of 0.3 solar masses there might be 69,000 orbiting planetary bodies, of which 5,000 had a similar mass to the Earth and 55 were in the habitable zone. Those in the habitable zone included 31 ocean planets, 23 dune planets and just one with Earth-like water content. For 1000 stars with half the mass of the Sun the simulation produced 75,000 planetary bodies, of which more than 9000 had Earth-like masses, and 292 were in the habitable zone: 60 ocean planets; 220 dune planets; and 12 with Earth-like water content. Finally for 1000 simulated stars with a similar mass to the Sun, there were 38,000 planetary bodies, 8,000 with Earth-like masses, and 407 in the inhabitable zone. Those in the habitable zone included 91 ocean planets and 45 dune planets, but 271 - the vast majority – had Earth-like water content. Although the detailed numbers in the statistics are not important, Ida and Tian highlight the contrast in the fraction of planets in the habitable zones having Earth-like water content between Sun-like stars and lower-mass stars is significant. At the same time, they state that further studies are needed to determine how efficiently water is retained in the mantle, as well as the evolution of its release to the surface. Journal: Nature Geoscience scheduled to go live online 7th February 2015 at 01:00 Japan Standard time. Nature Geoscience website:Simulations by researchers at Tokyo Institute of Technology and Tsinghua University indicate that in terms of water content, Earth-like planets are more likely to be found orbiting Sun-like stars rather than lower-mass stars that are currently targeted in the search for habitable planets.